Subaru Viziv Tourer Concept revealed – next Levorg? Home » Cars » Subaru Viziv Tourer Concept revealed – next Levorg? 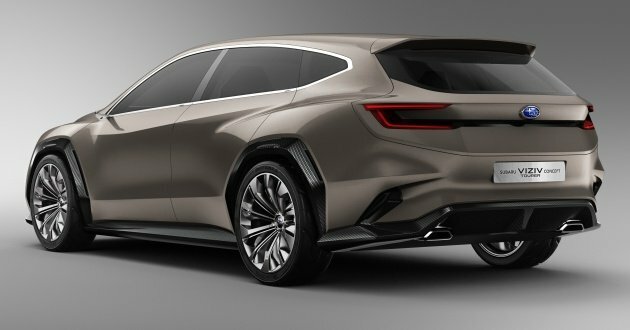 Subaru has revealed the seventh instalment of its Viziv series of concept cars at the ongoing Geneva Motor Show. 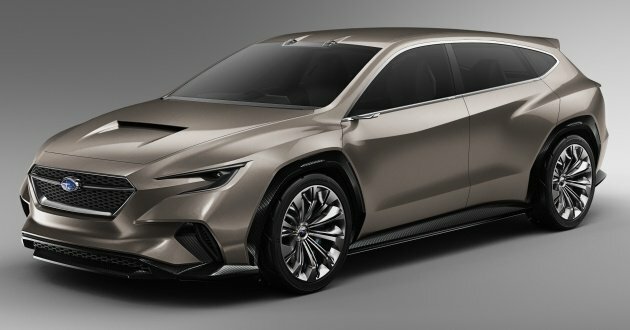 The Subaru Viziv Tourer Concept, as it’s so called, is a wagon-bodied show car that could point to a replacement for the current Impreza-based Levorg. The styling is very similar to the previous Viziv concept, the Viziv Performance. There’s the same C-shaped headlights bordering a hexagonal grille, the same prominent bonnet scoop, the same carbon fibre wheel arch extensions and the same sculpted side surfacing with strong haunches and upswept shoulder line. The tail lights are also C-shaped, and are integrated into the tailgate to give it an Audi-like look. The fact that the Viziv Tourer bears a striking resemblance to the Viziv Performance, which is expected to presage the next WRX, is no surprise. After all, the Levorg is a close cousin to the WRX – both share the same basic body, interior, 300 PS 2.0 litre direct-injected turbo flat-four (in Japan at least; we got the smaller 170 PS 1.6 litre mill) and much of the front fascia. Measuring 4,775 mm long, 1,930 mm wide and 1,435 mm tall, the Viziv Tourer is 85 mm longer, 150 mm wider and 55 mm lower than the Levorg, and has an 80 mm longer wheelbase at 2,730 mm. It’s powered by a boxer engine of unspecified capacity and output, and comes with Subaru’s trademark Symmetrical All-Wheel Drive system. Safety-wise, a next-generation EyeSight driver assistance system is fitted to the Viziv Tourer, and Subaru says the system is slated for a commercial launch sometime in 2020. This, coupled with radar and “highly accurate” navigation and GPS systems, is said to be part of Subaru’s goal of eliminating road accidents.